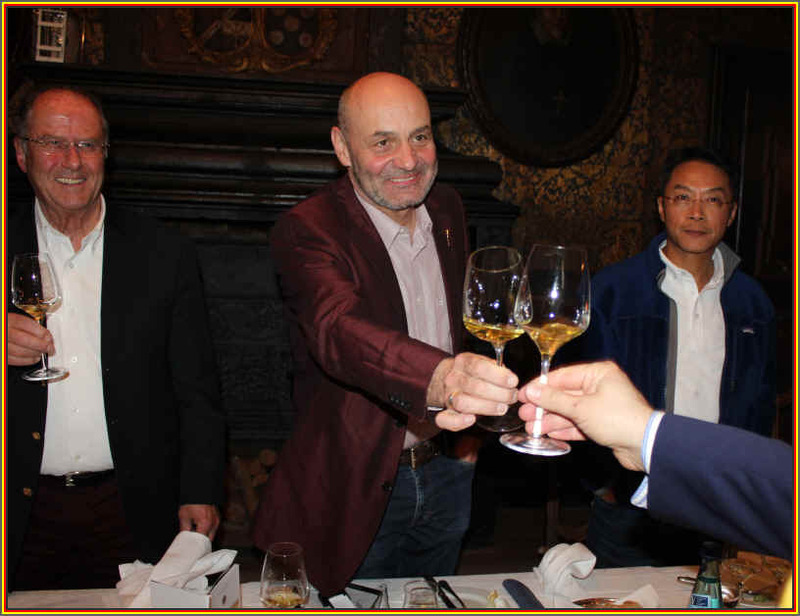 It was a great honor to be invited to the most remarkable wine-tasting of German Rieslings. 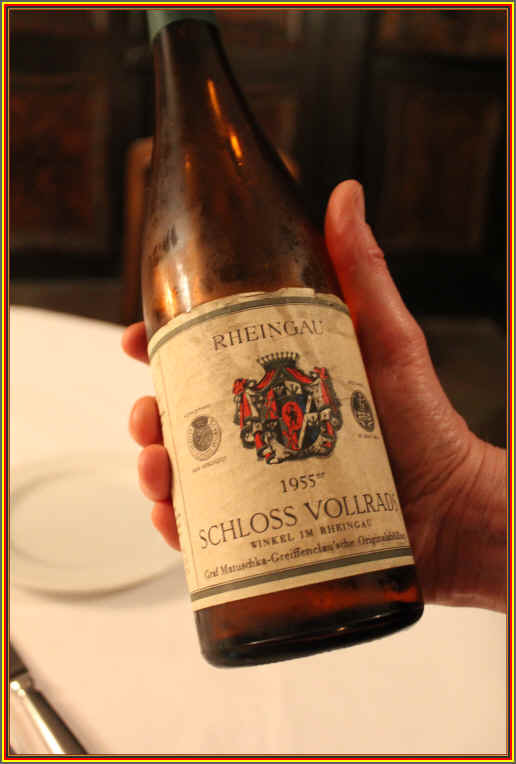 The famous Rheingau estate of Schloss Vollrads hosted a stellar evening that can never be replicated. 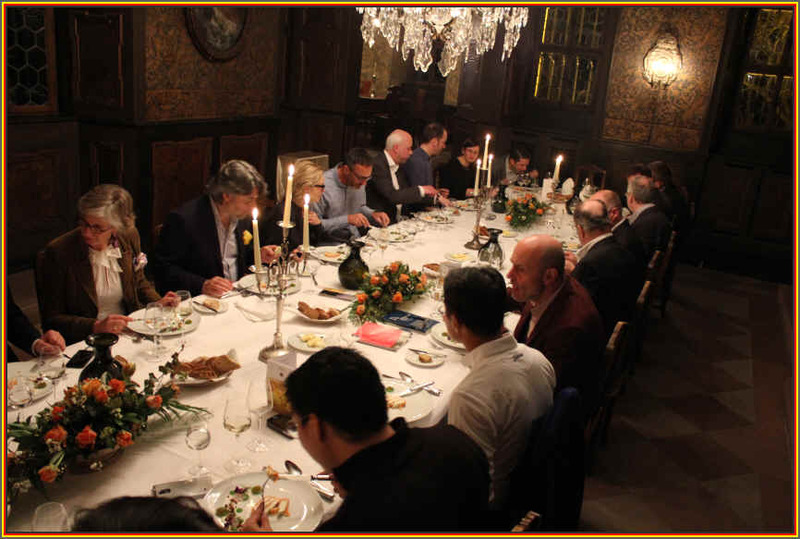 It was a night featuring bottles of wine from a former Vollrads' winery worker who lived a short distance from the estate. Every-so-often the staff would be gifted with wine from the property. 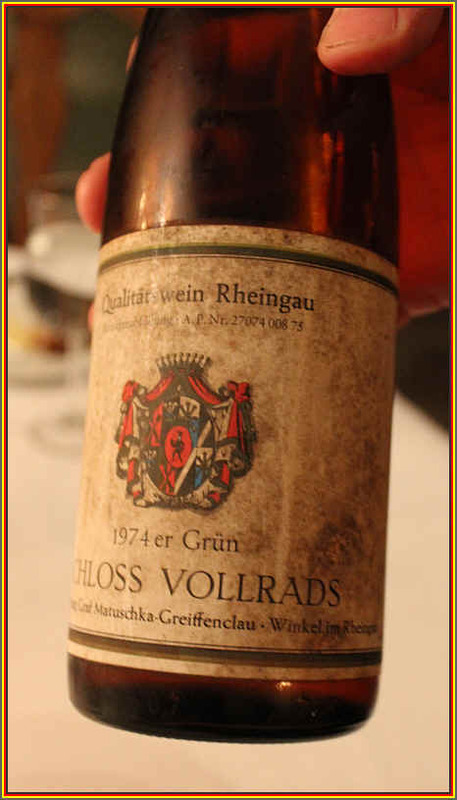 This guy, who worked for Schloss Vollrads shortly after World War II, would tuck away these gifts in his underground, cold cellar and it appears he wasn't much of a drinker. Or he never found the right occasion to open some of these bottles. The old boy passed away early in the 21st century and his aging widow wanted to liquidate the liquids in the cellar. 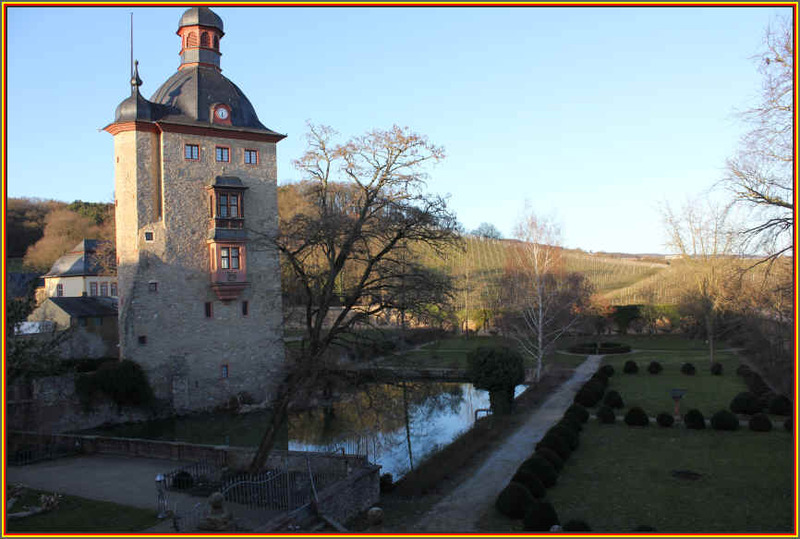 Now Schloss Vollrads is an historic place and company. There are records showing the first sale of its wine took place in the year 1211. This is slightly ahead of the advent of the internet, for example. 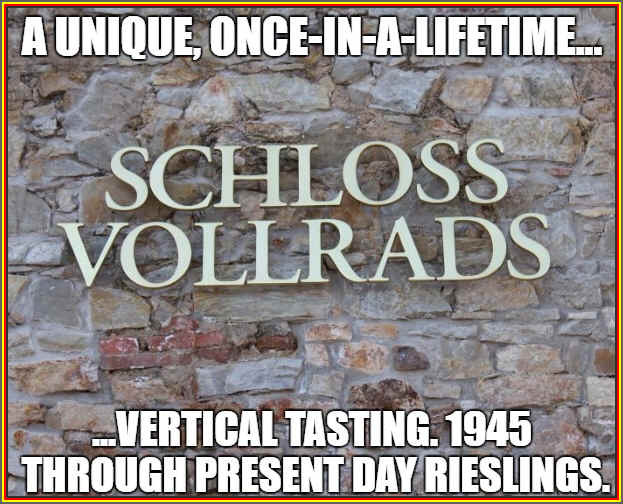 In 1492, while Columbus was taking one of his little boat rides, at the Vollrads estate they opened what is called a Gutsausschank, a sort of precursor to today's wine-tasting room. 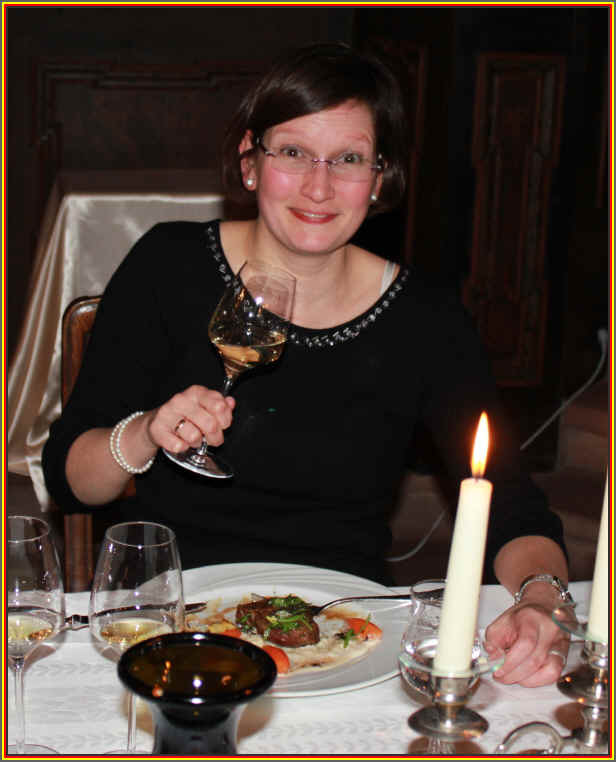 They were able to pour their own wine at this little German wine tavern. There's even a record of one of the locals running up a big bill in his quest to quench his thirst. The fellow drank so much that he owed the equivalent of two day's wages. 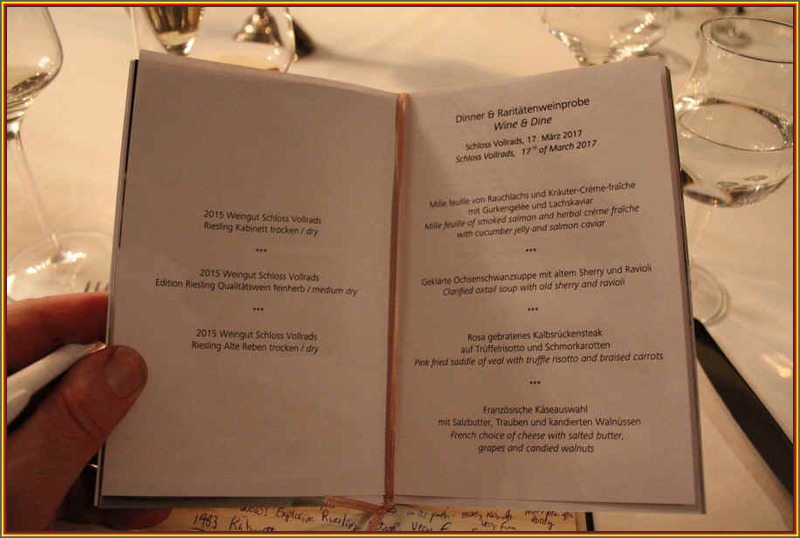 There is no record of how many points or stars he awarded the wines in his tasting notebook. 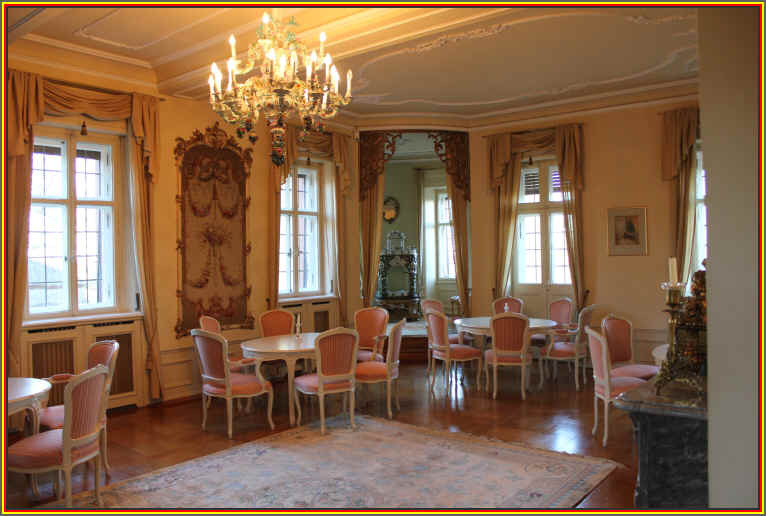 The term "Cabinet" (Kabinett these days) is said to have originated here at Schloss Vollrads. 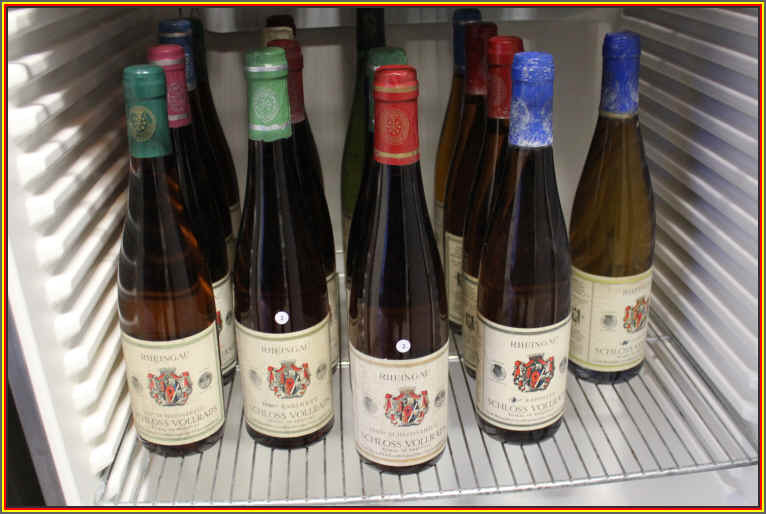 In the early 1700s the vintages had been poor quality and scarce. But finally they had a couple of abundant harvests and needed storage space for wines of quality (and higher price). There's evidence of a bill from a bricklayer for a special cellar which was known then as a "Cabinet." 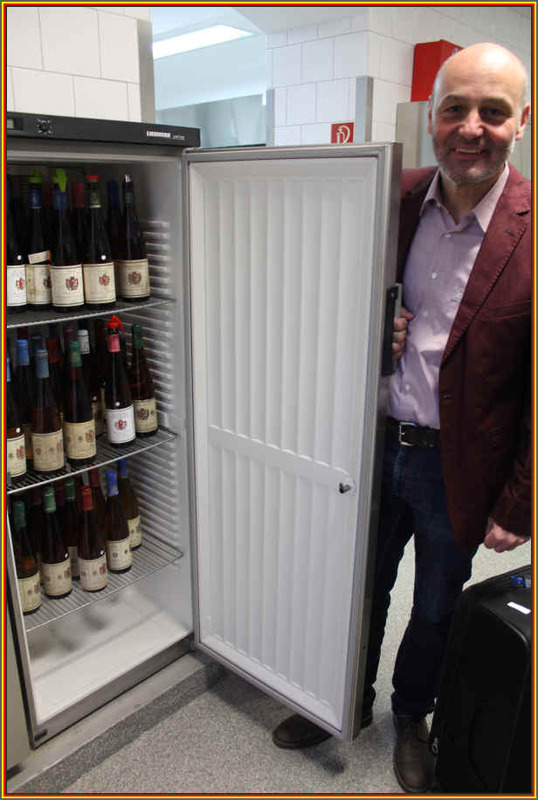 There had been a small controversy as to which winery in the Rheingau had the first wine "Cabinet." 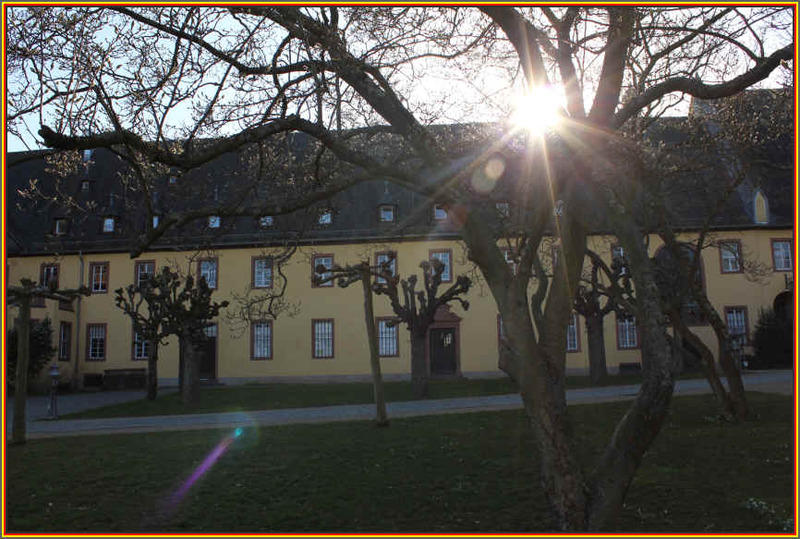 It was thought that Kloster Eberbach had the first, but theirs was, we now know, constructed in 1739. 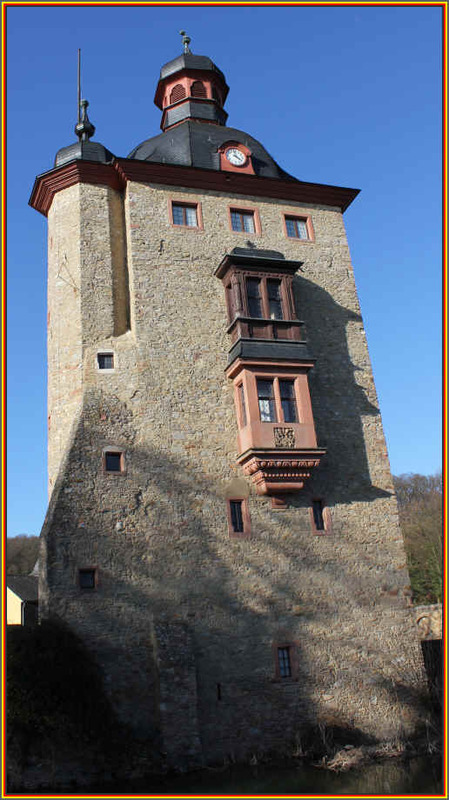 Schloss Vollrads still has the bill (which we know was not paid with an American Express card, but cash) from 1716 when their Cabinet was built. They still have old books and ledgers from those days and it seems the wines aged longer in the Cabinet were sold for higher prices than normal wines. 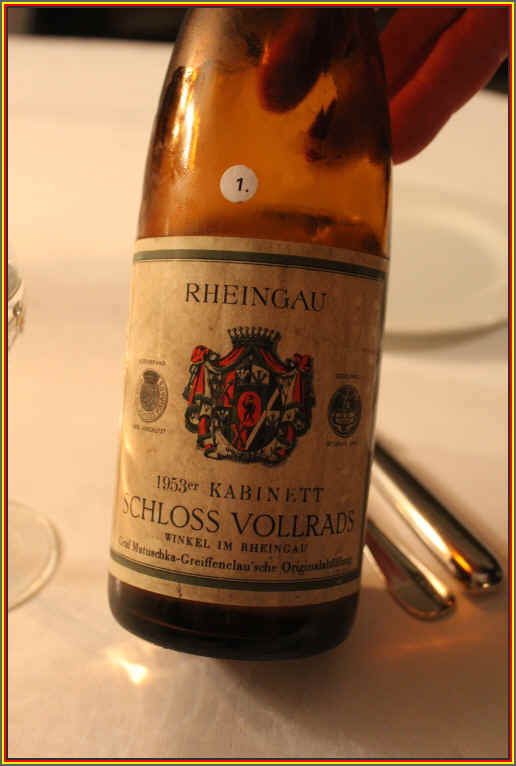 In 1971 the German wine laws were enacted and the term "Kabinett" officially became a special designation for wine of quality. 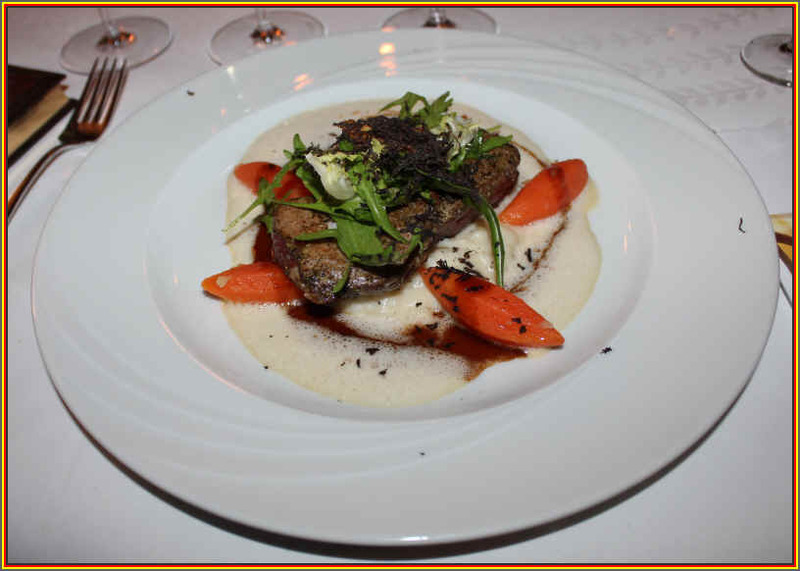 Of course, we know it as the first level of wines made from ripe grapes which do not need the addition of sugar. 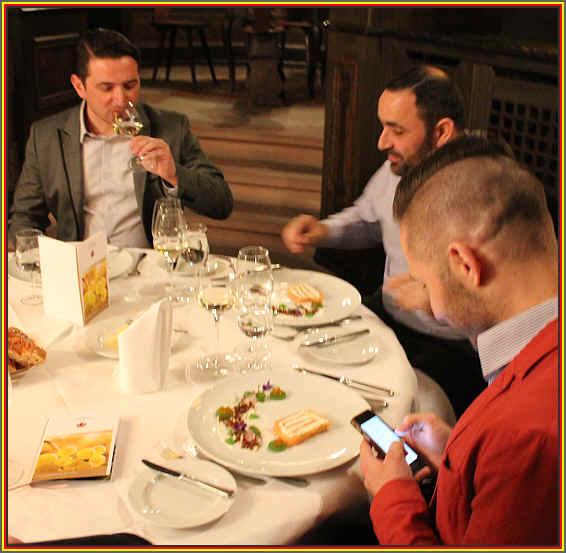 Beyond that, they adopted the other, now familiar terminology on wine labels such as Sp�tlese, Auslese, etc. The widow of that old Vollrads worker contacted a local wine merchant and he was, indeed, interested to see the contents of the cellar. 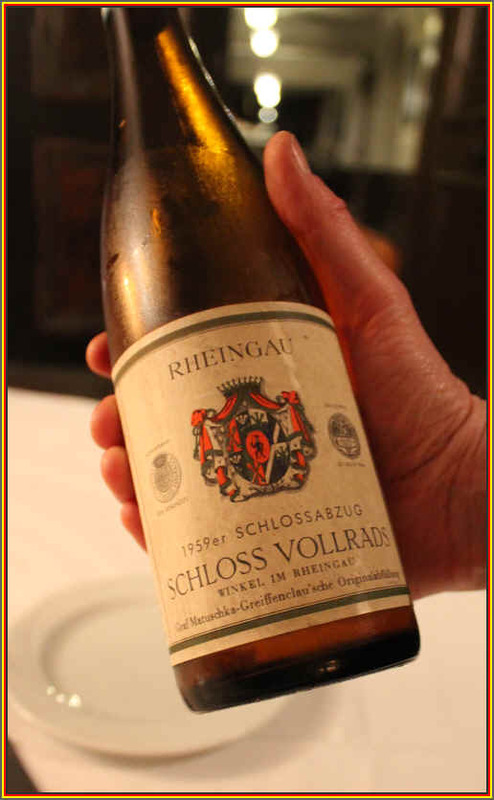 There he found, amongst other wines, a cache of venerable bottles from Schloss Vollrads. Some of the wines bottled shortly after the War would be difficult to sell, he decided, since the there were some issues. 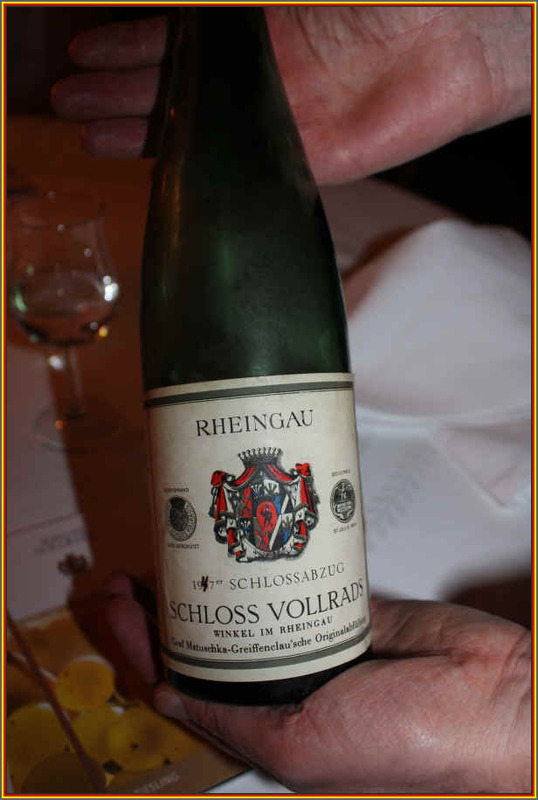 A client might question why a Rheingau wine was in a green glass bottle instead of the traditional brown glass. Glass was in short supply and they ended up using whatever was available. Someone might question whether a wine with handwriting over the printed vintage on the label was, in fact, legitimate. As these bottles were gifts intended for drinking, not collecting, if they didn't have the exact label, it was not viewed as problematic. 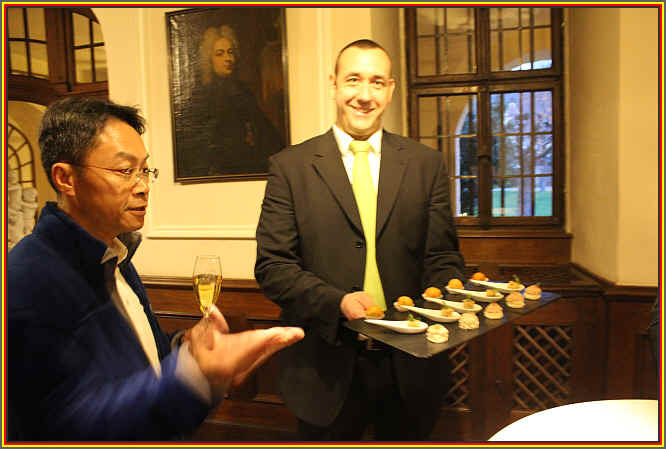 The merchant would provide the wines from the domaine and Schloss Vollrads would provide the venue for tasting the wines. 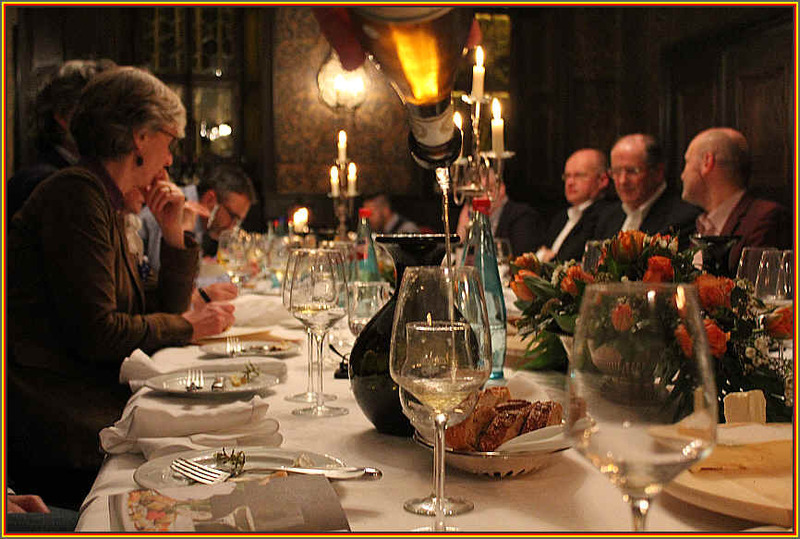 In addition, Schloss Vollrads organized a catered dinner and the wines would be opened from youngest to oldest (mostly) and a couple of sommelier-attendees would preview the various vintages and then take care of pouring the wines. 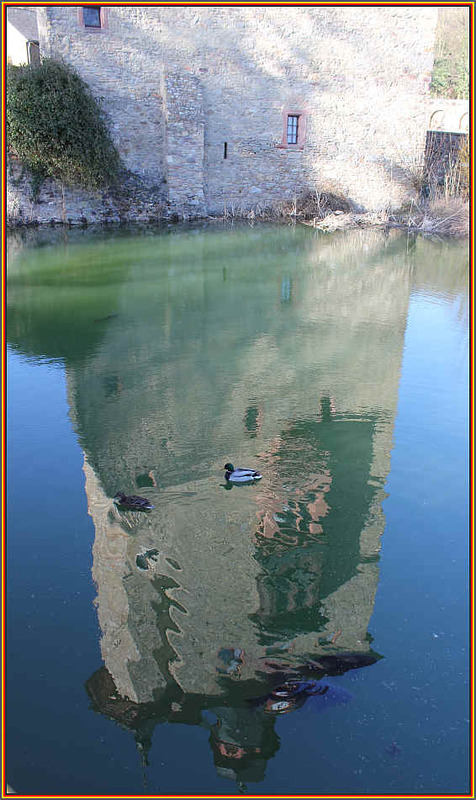 There's a beautiful old tower on the property. 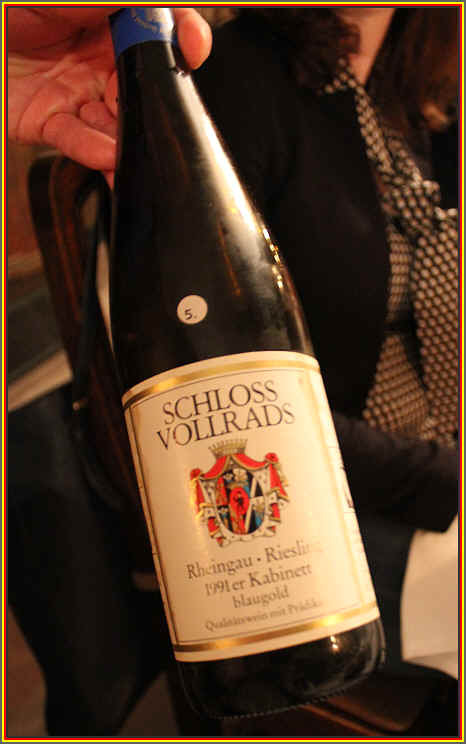 Rowald had pointed out, on a previous visit to Schloss Vollrads, the unique geology found in the vineyards. 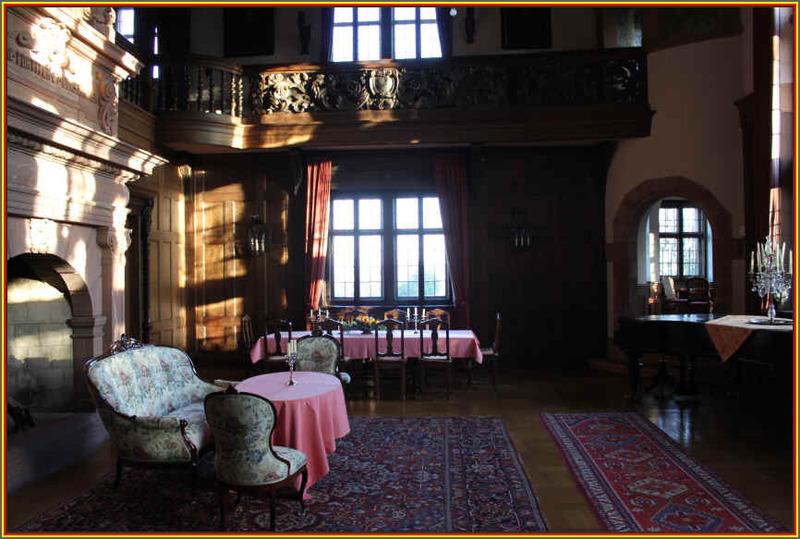 The inside of the castle is remarkable. Herr Hepp was delighted to show off the treasures to be opened. 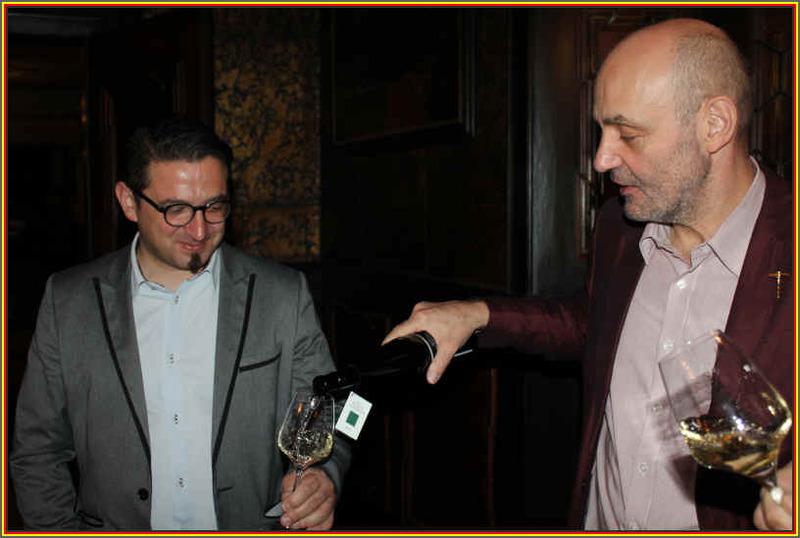 That's Schloss Vollrads winemaker Rowald Hepp with the glass of bubbles and the fellow in blue is wine merchant Nedjelko Mrcela of the wineart company. Nedjelko took care of generously providing the wines for this amazing tasting. 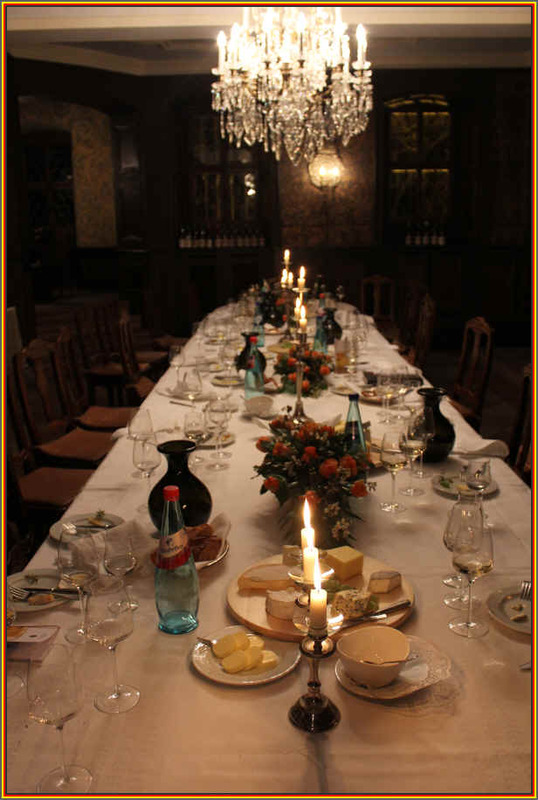 After everyone arrived and had a sip of bubbles and perhaps a nibble of a starter, we strolled into a magnificently elegant dining room which was prepared for this grand event. Rowald welcomed everyone...our group was from all over the planet, too. 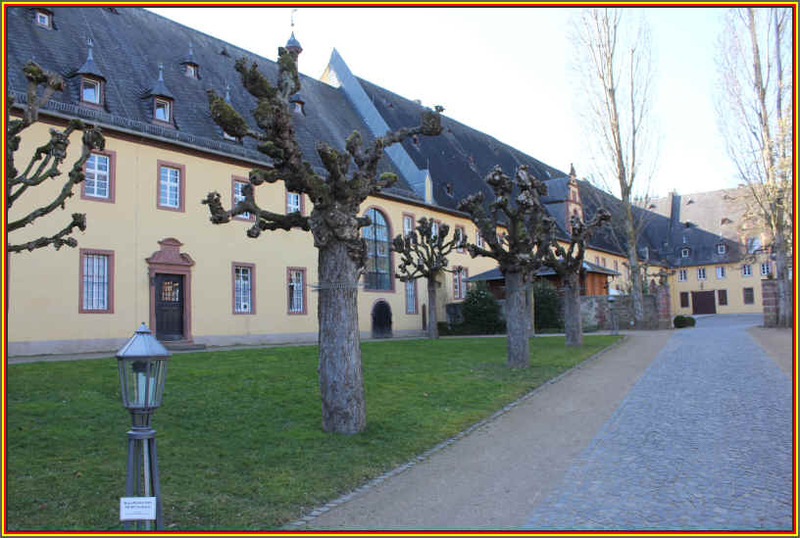 The fellow sitting just past Rowald was born into the wine business at Kloster Eberbach, a monastery winery not far from Vollrads. 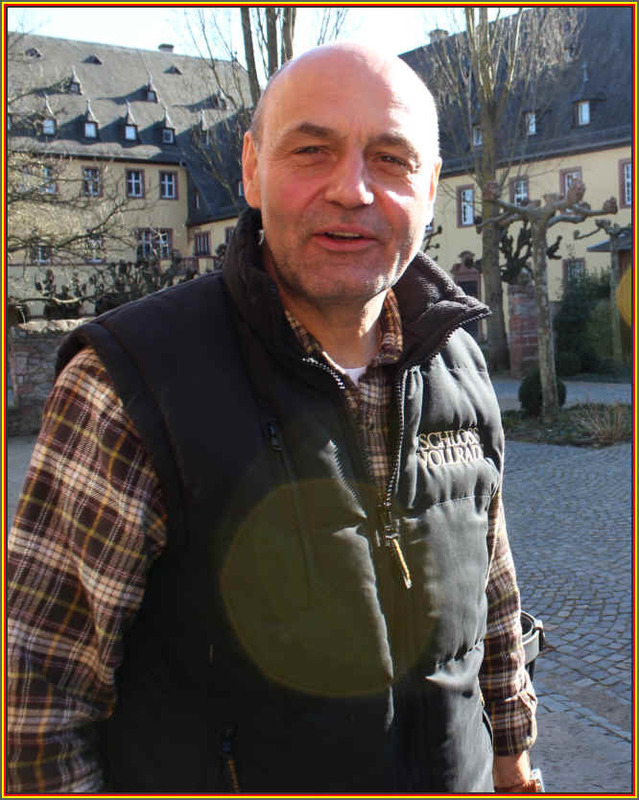 Joachim "Agi" Ress knows everyone and everything about everything in the Rheingau region. 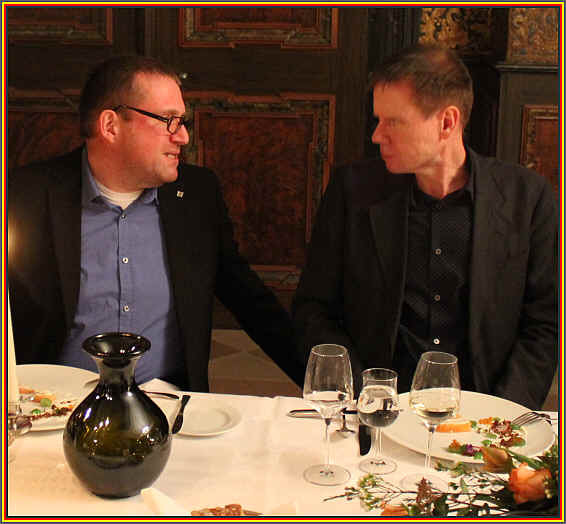 His took over his father's wine company, Karl A. Ress, many years ago after doing an internship at Schloss Johannisberg. 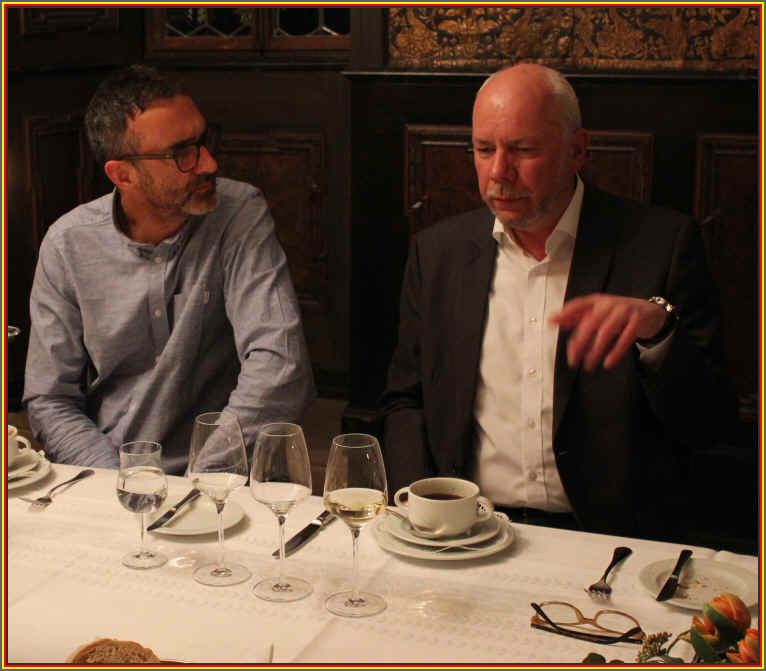 After stints with Asbach & Company in the Rheingau and the American "Kobrand" company, he assumed the helm of his dad's company and has been a major mover and shaker in the German wine world. 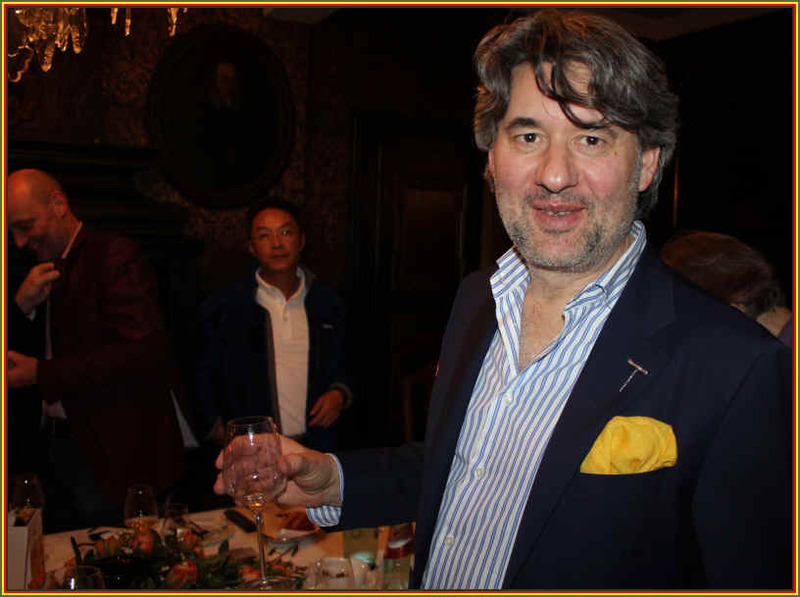 Thanks to his encyclopedic knowledge of German wine, Agi was able to explain vintage conditions and enlighten the tasters about many of the wines in our little Vollrads Marathon. 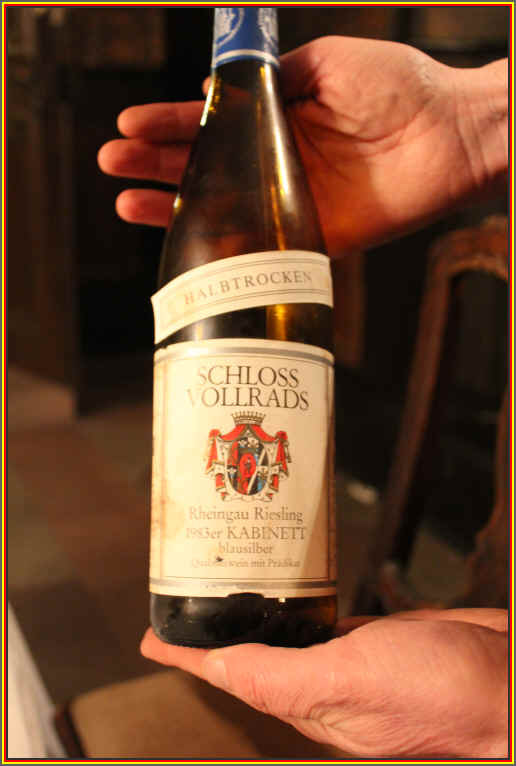 We began the marathon with a 2015 Schloss Vollrads Riesling Kabinett Trocken. Good nose, fruity and fresh...tart...crisp...fine...very young and needs time to develop. 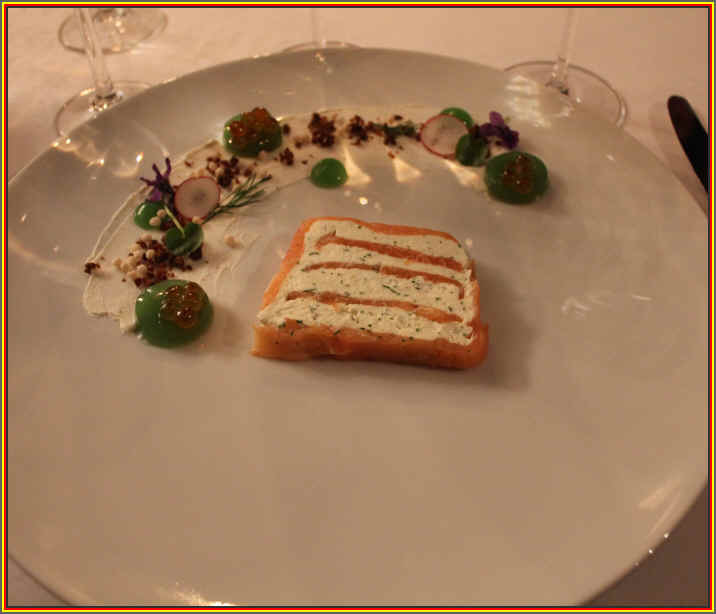 The first dish was a "Lachs Terrine." You must have a look at the capsules covering the corks. BLUE typically was a Kabinett level wine. PINK or ROSE was a Sp�tlese wine. was an Auslese level wine. The vintage assessments for the 1991 harvest suggest the wines were not especially good quality. Perhaps no critic back in those days was enthusiastic for the 1991s as they did not have the idea anyone would save bottles to drink more than a quarter of a century later. And so this wine, then, became all the more worthy of the adjective "astonishing." I use a three star scale, which is actually more than merely three levels of quality, as some wines (many) are not worthy of even a single star. Further, there are gradations to be had such as half and quarter marks in between the stars. Probably I was overly enthusiastic for this wine given that it was served immediately following a really young, backwards, undeveloped 2015 vintage. Still, this was gorgeous! 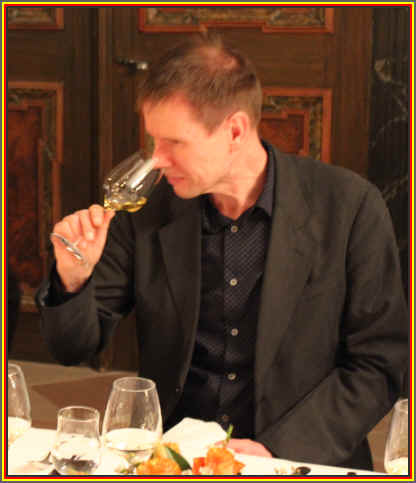 It displayed notes of petrol and had perfect balance between sugar and acidity. Perhaps in its youth this was a bit shrill and overly tart. But now it was just perfect and very memorable. 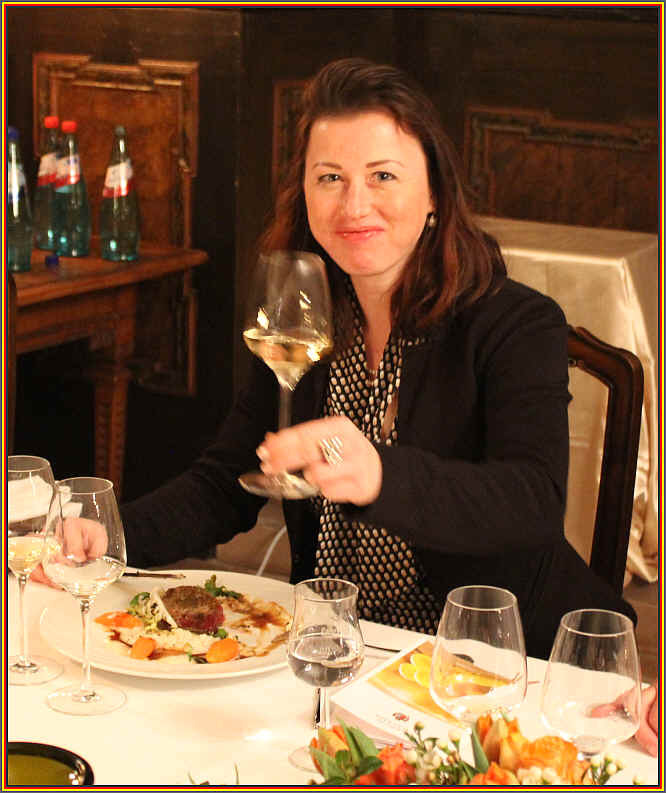 I jotted down Three Stars in my tasting notebook...the wine was that good at that point in time. This was a highly regarded vintage in its youth. 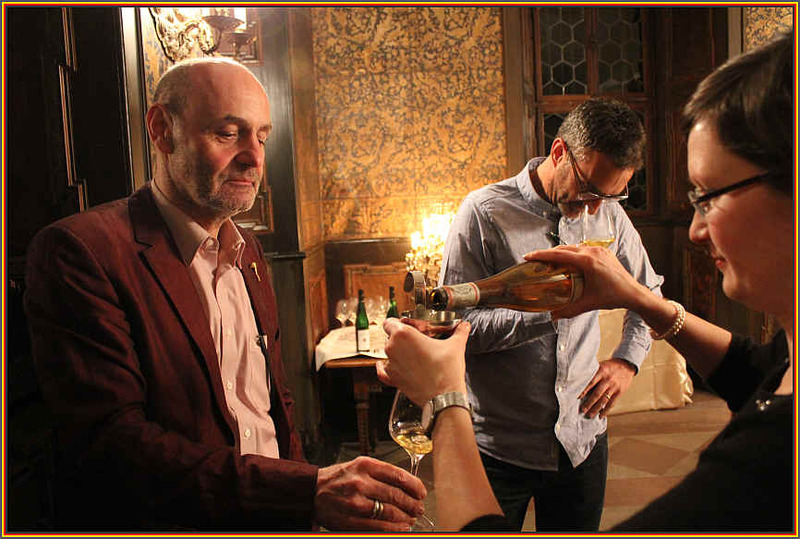 The wines typically had no botrytis (or very little). After a few years, the vintage was generally down-graded a bit, but it was the first year in maybe 5 or 6 or 7 that produced wines with some quality and promise. This bottle had a slightly odd or funky aroma with notes of baked apple. It's still crisp and with a bit of sweetness, maybe 15 grams. But it doesn't have much in the way of complexity, even with the bottle aging. I still gave it one-and-a-half stars. 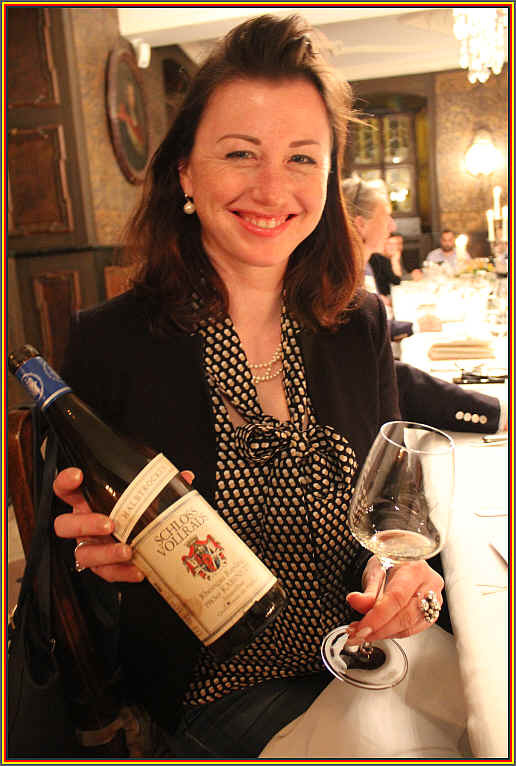 Christiane Grafe of Grand Cru Select shows off a bottle of Schloss Vollrads from her birth year. No, it's not the 1991. but not much older than that! 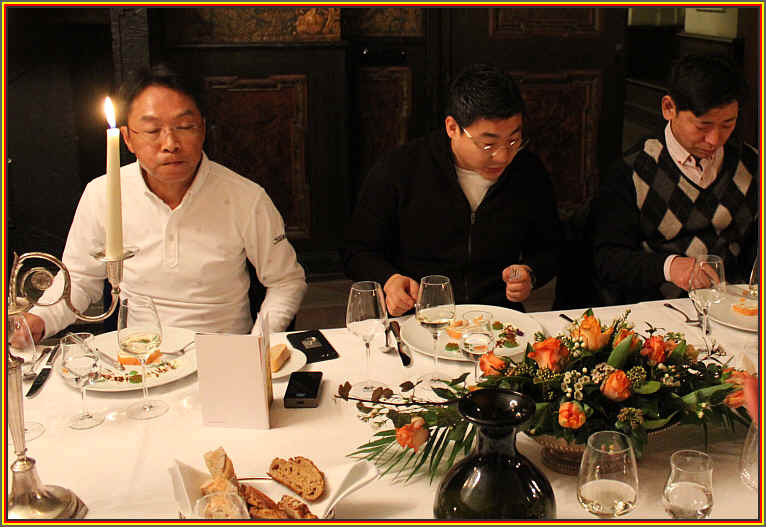 We next tasted a wine that is a special bottling selected very democratically. It's a staff selection with each Vollrads staffer getting one vote. 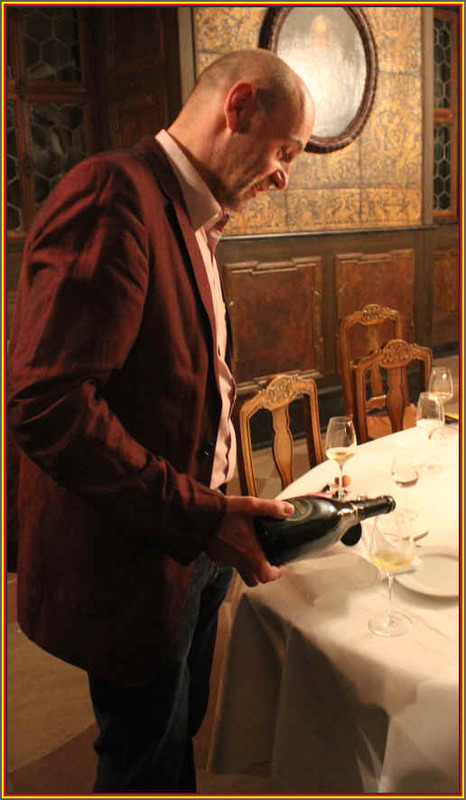 They look for the wine that best represents the estate and the vintage. At this stage the wine is a bit quiet in terms of aromas...nicely fresh and fruity...slightly sweet...good. Going back to this after tasting a couple of the next wines, it was more showy. Context...it can make all the difference in one's appreciation of a wine. I gave it 1/2 to 3/4s of a star presently. Then they brought out the soup. 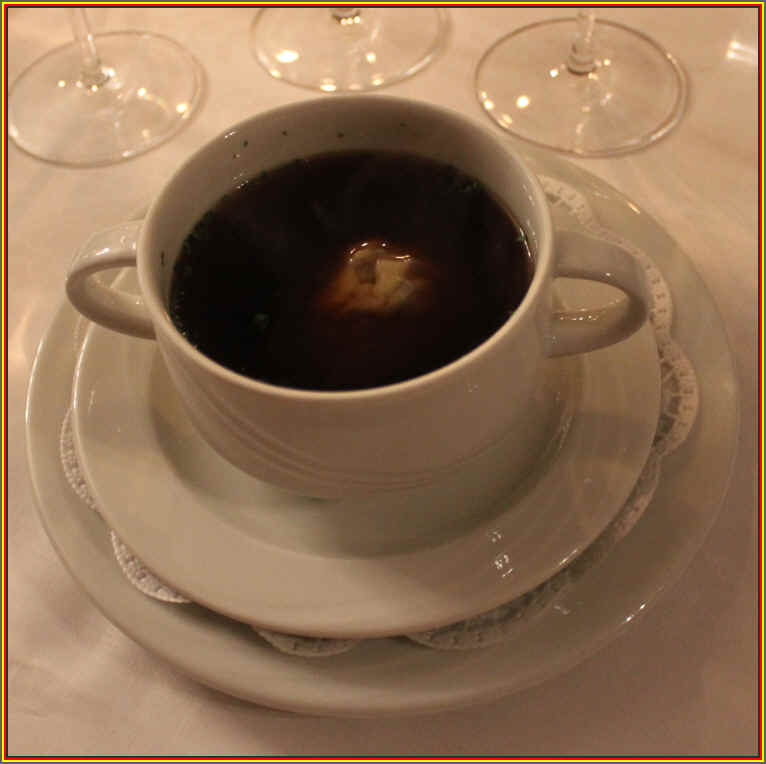 Oxtail Soup with Old Sherry and Ravioli. The 1974 harvest was generally written off as the summer was not especially warm and autumn saw a lot of rain. This wine had a fairly golden color. I found metallic notes on the nose with a lightly earthy, rather than fruity, flavor. 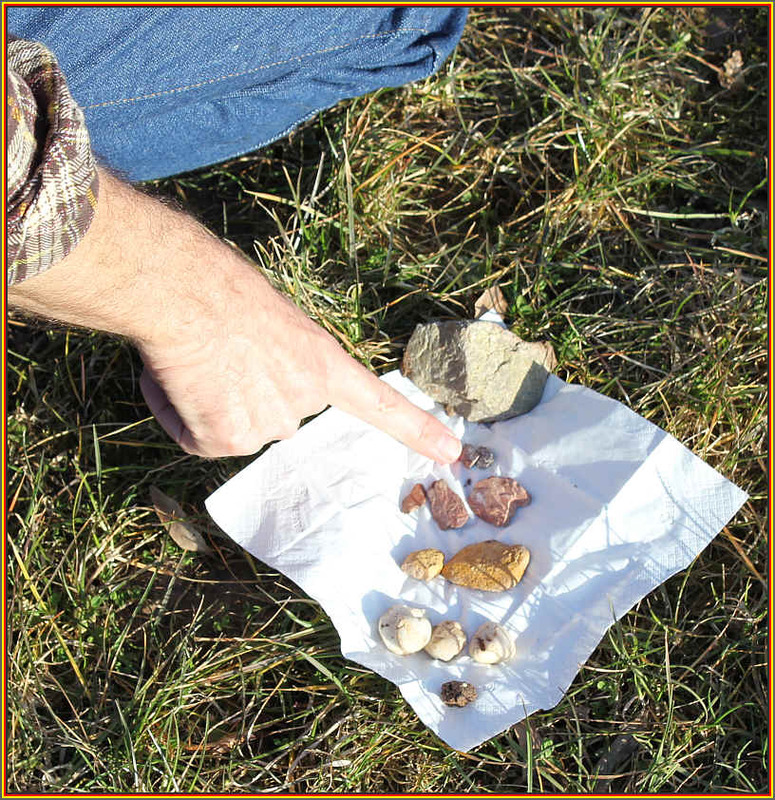 Stony notes...seems fairly dryish...as it warmed I detected a kind of wool/sweater fragrance. Maybe half to three-quarters of a star. 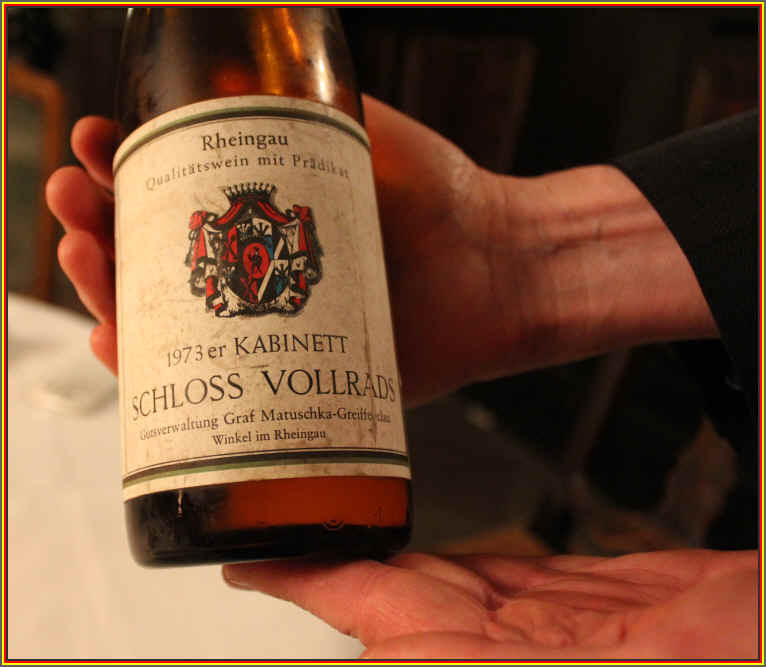 This came from a very large crop and critics described the wines as being pleasant enough for immediate drinking, but the wines of 1973 are not profound or cellar-worthy. I didn't find the nose to be particularly distinctive. I detected a metallic quality as I had in the preceding wine, the 1974. It seems to rely primarily upon its residual sugar for character and that's about all you'll find here. As it warmed, I encountered a faintly woody aroma and flavor...it improved with airing, too. 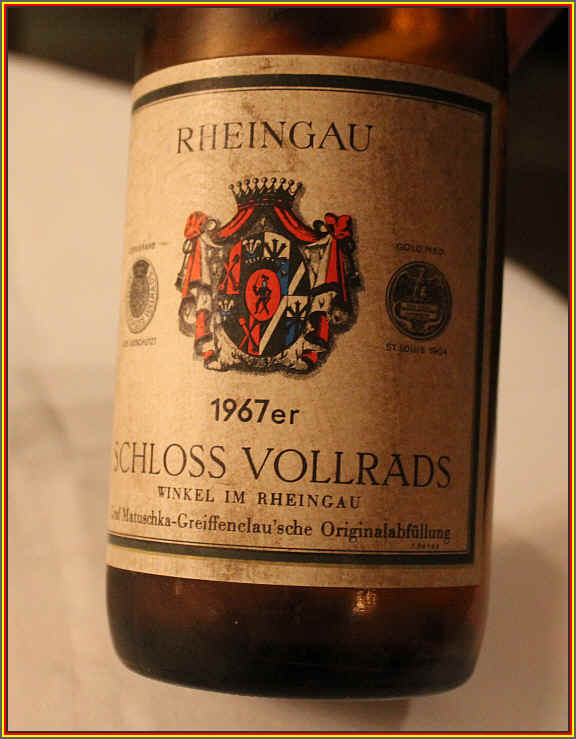 This was thought to be a very good vintage, but when the 1976s came out, these fell by the wayside to some degree. The more flashy and bigger 1976s overshadowed the 1975s. But, in general, the 1975s have held up better thanks to a bit higher level of acidity. This bottle was a bit odd...I encountered some cellar fragrances, but it was not corked or musty smelling. The nose was good at the start and then it began to go towards an odd character. 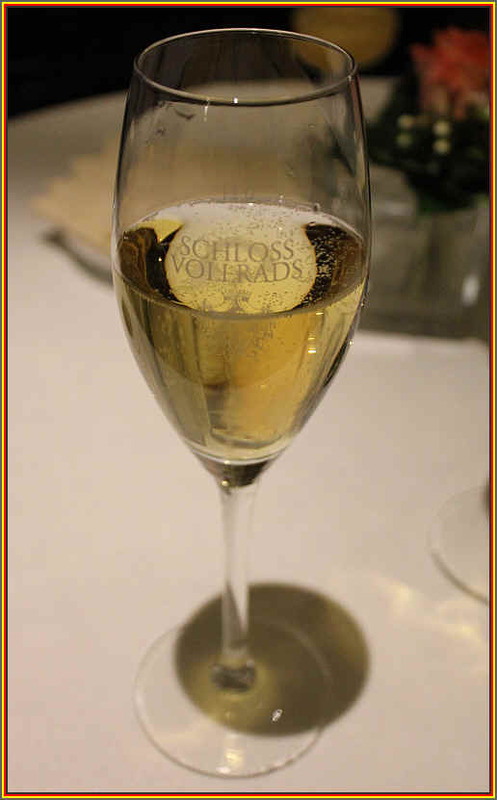 The sugar is balanced by crisp acidity, so it hits the palate nicely. I gave it one star, but a different bottle, if showing a bit more brightly, could possibly earn a higher rating. The 1971 vintage is said to be a hall-of-fame year. 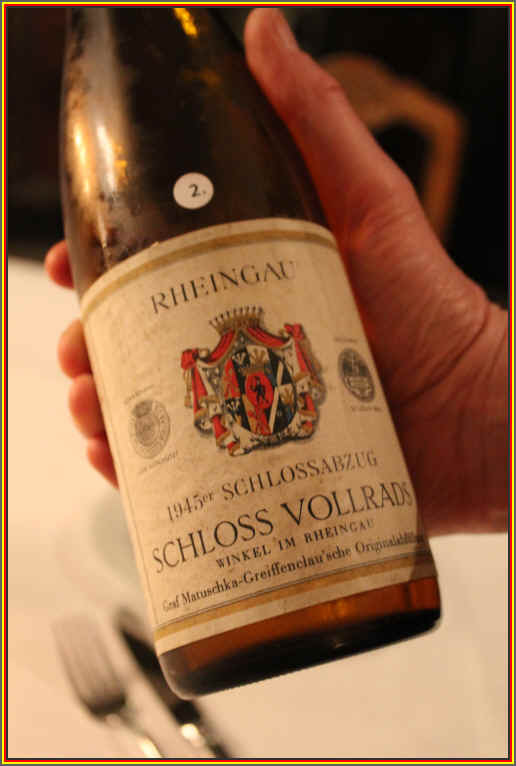 Many people compare it with the 1949 and 1953 wines, though not as voluptuous as the 1959s and the fruity, ripe 1964s. This bottle is less sweet and lower in acidity than the previous wine, the 1975. But it's still in remarkably good condition...very fruity and so elegant. There's a fine balance of sugar and acidity and it will probably remain in good shape for a number of years from today (2017). Fresh, floral, fruity, sweet, light, zesty...and young. A baby. Should develop most handsomely but it's too young to find anything profound here. But it's very promising, for certain. This was an odd vintage...late to start but then a lovely, warm summer followed by intense and potentially damaging rains in September. 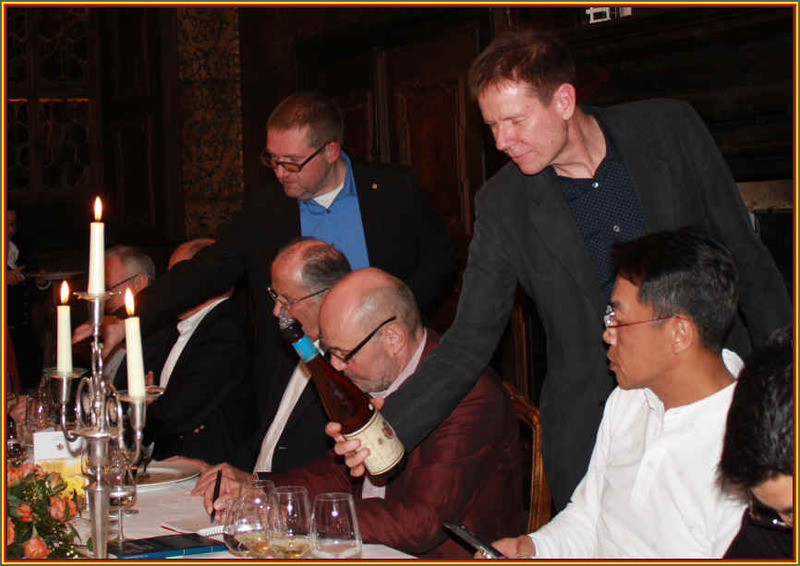 But it seems producers who waited out the storms were able to make some very good sweet wines. The color is a bit brassy, but still in good condition. It's tight on the nose, believe it or not, with a mildly floral note. Clean and light...off dry...it is simply a bit shallow on the palate. I gave this a one-half star rating. The vintage was viewed as being pretty good, but not exceptional in its youth. It was viewed as less showy than the 1964s and the quantities were relatively shy. The growing season was fine, but turned cold at summer's end. And wet. The wines had generally good acidity, though. Oh my! This was excellent!! Great nose...so complex and complete with a beautiful balance of sweetness and crisp, edgy acidity. There's an almost woodsy character here, too. Very fine. Elegant. Complete and profound. Harmonious. Can't find enough superlatives to describe this. Though 1961 is magnificent in Bordeaux, Germany did not get the same sort of weather during the growing season. It saw a good Spring but poor summer and then hot September...The vintage didn't produce much in terms of late harvest wines, but the normal quality level wines were considered acceptable back in the day. This had a rather youthful, straw color. The fragrances were nicely fruity with a mildly resiny tone...a hint of a pine. It opened a bit, showing a metallic note. It's simple and direct, showing well with no signs of frailty from old age. One-and-a-half stars. The 1959 vintage was considered to be extraordinary. 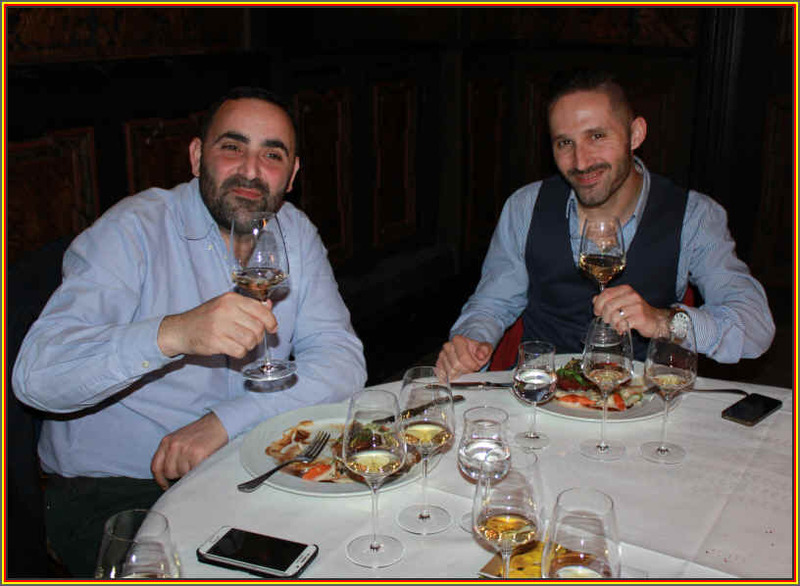 It followed a handful of less-than-exceptional vintages and the summer was quite hot, producing good levels of sugar at the low end of the spectrum and allowing winemakers to produce a good range of sweet wines. The color was brassy and the nose showed almost waxy notes with lightly honeyed tones. The wine is mildly sweet with remarkably fresh flavors. There's still a bit of a youthful quality here though it's certainly developed and has blossomed handsomely. Nicely balanced. Light yet complete. 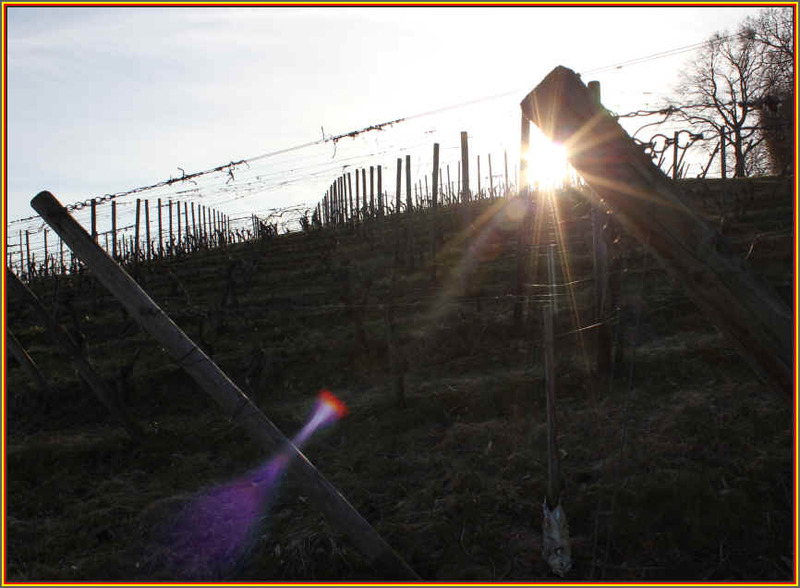 The vintage saw frost in the early season, reducing the crop. With mid-summer sun, things looked promising until it rained in August and well into September. The wines were described as useful for the short term. Light to medium straw in color...the nose showed some steely, minerally notes and light fruit. There's a bit of sweetness and still crisp acidity. 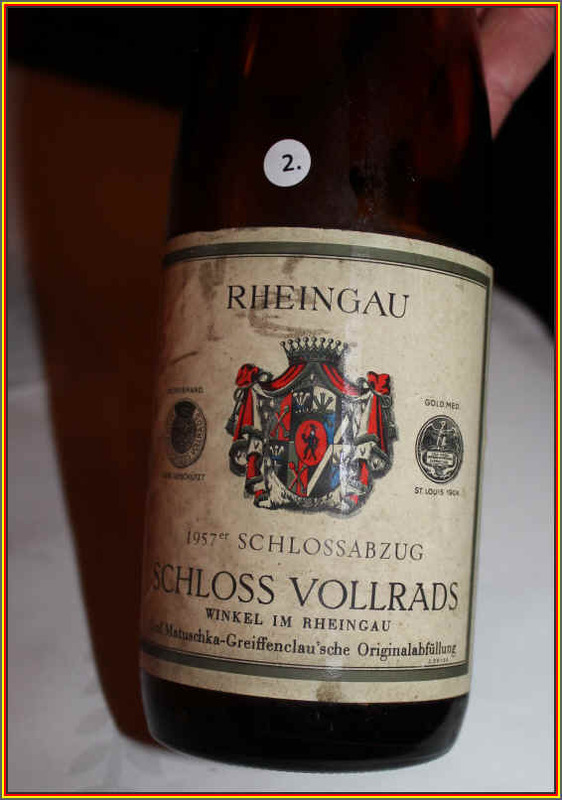 It must have been a difficult little wine in its youth and nobody would expect it to be drinkable at nearly 60 years of age, yet it's a young, crisp, tart, tangy Riesling. Viewed as a standard quality vintage and one for rather immediate drinking. This wine was medium+ straw in color and had a much more developed, mature, ripe nose. I detected a note of rye bread (roggenbrot as we say in English). There a bit of sweetness here and it's achieved a point of balance in terms of sugar and acidity. This is nicely drinkable but there's not much depth here. 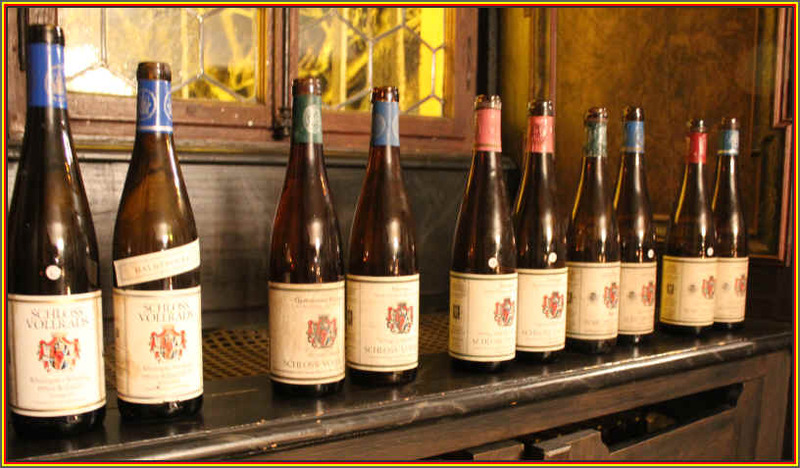 The 1953 vintage was highly-regarded from the outset. There were good wines up and down the scale. It was not known, though, if the wines would age, but people were simply happy to have good wines made of ripe fruit. 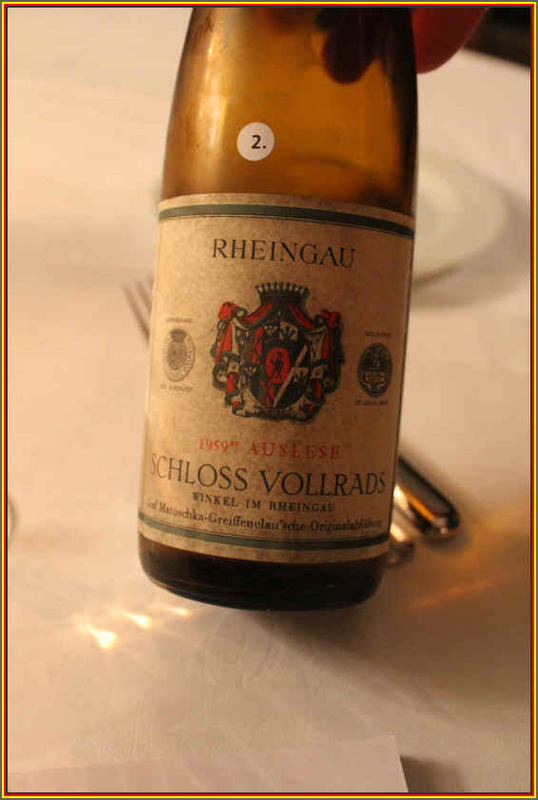 Rowald explained this was a "life-saving vintage." That is, after a few poor years, vineyard owners might have ripped out the vines if 1953 had been a bad year, as well. Medium straw in color, this had a mature nose and maybe a note of an acetic tone...but then with air, it seemed to blow off or I became accustomed to it. The wine is quite good on the palate, in any case. Nicely sweet with fine acidity. It has a dryish finish with good length...maybe a note of a peach-like quality. Good texture and balance. Very good...faintly nutty (oxidized) on the finish. The 1945 vintage was a very small crop...the weather had cooperated nicely during the summer, but in the wake of World War II there was a labor shortage. As Rowald pointed out, think of the women whose husbands had been shipped off to war who were left to tend the vineyards and make the wine. This must have been a really difficult state of affairs. Two and a half stars to three stars. 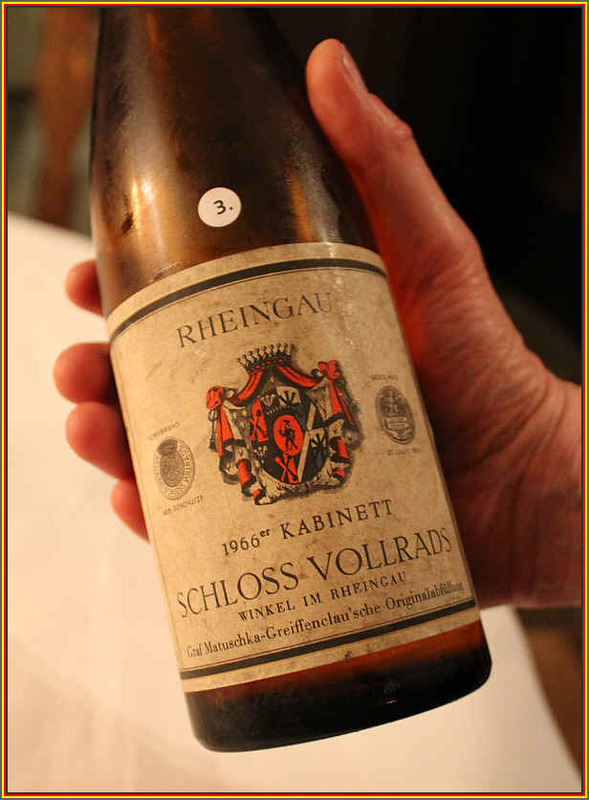 As noted above, the 1959 vintage was a good one, with wines of quality up and down the scale. Did the fellow keep these bottles for some time in a closet where moth balls were present??? The wine is beautifully lush and sweet on the palate...a note of opulence, being sweet and round. Medium-bodied and fine, but it's not profound or complex. Still, it's a very good wine. The 1950 vintage was well-regarded when the wines hit the market, but these were not cellar-worthy wines and, as you might expect, were consumed immediately. There's not much buzz about the vintage. 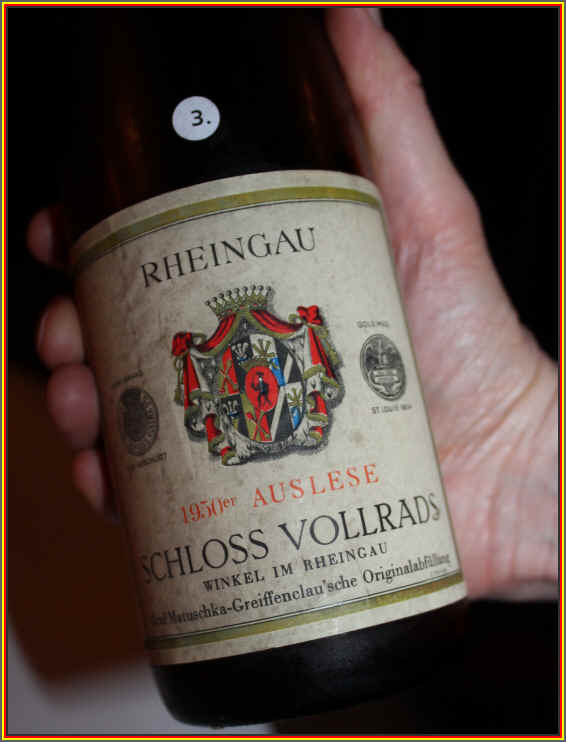 If I recall Rowald's comments, it wasn't a vintage that was really capable of producing much sweet wine and the idea of producing a good Auslese in 1950 was more like wishful thinking. The wine was medium straw in color and it was a bit muted on the nose. The wine is still alive, though and only mildly sweet with fairly crisp acidity. 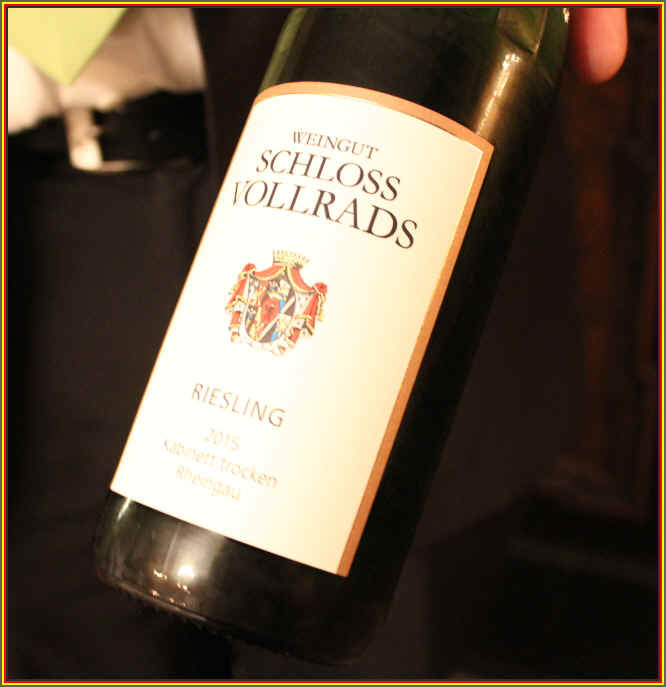 It doesn't show great fruit or complexity, being rather a shell of an Auslese wine. The vintage was described as being quite ripe, as the growing season was fairly warm all the way through. As you can see, this has handwriting over the vintage date as they had, apparently, run out of 1947 labels for this wine. Medium+ yellow in color/lightly brassy...but the fragrances are amazing. Pungent, with an almost green herbal character...menthol? Mint? It's sweet and still crisp and fresh on the palate. Exuberantly fruity...This may be the wine of the night for me. And so people stood up from the table and they headed out the door. 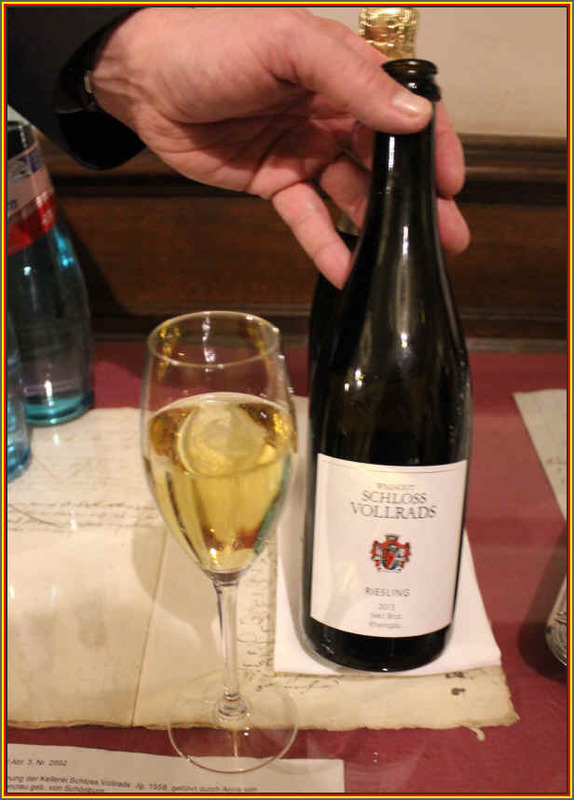 A Schloss Vollrads Sekt...very fine, too. 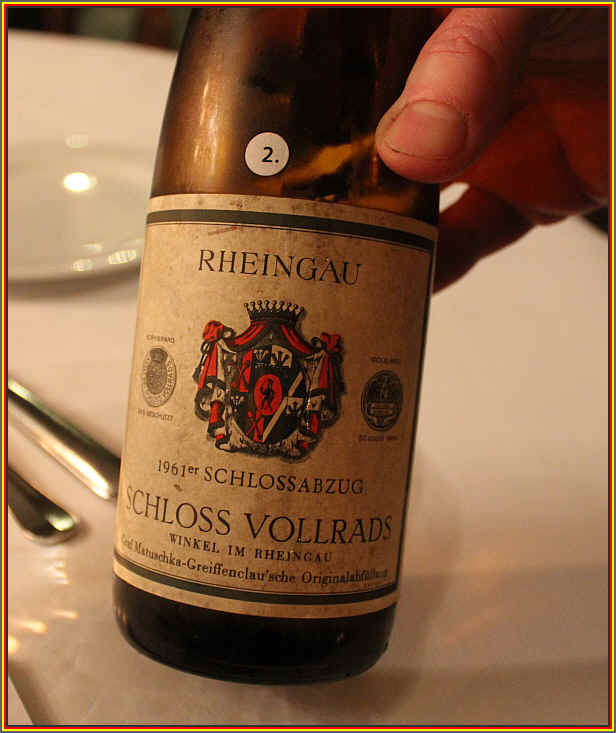 And then, another old bottle of Riesling made by a neighboring winery. I had visited J.B. Becker earlier in the day. 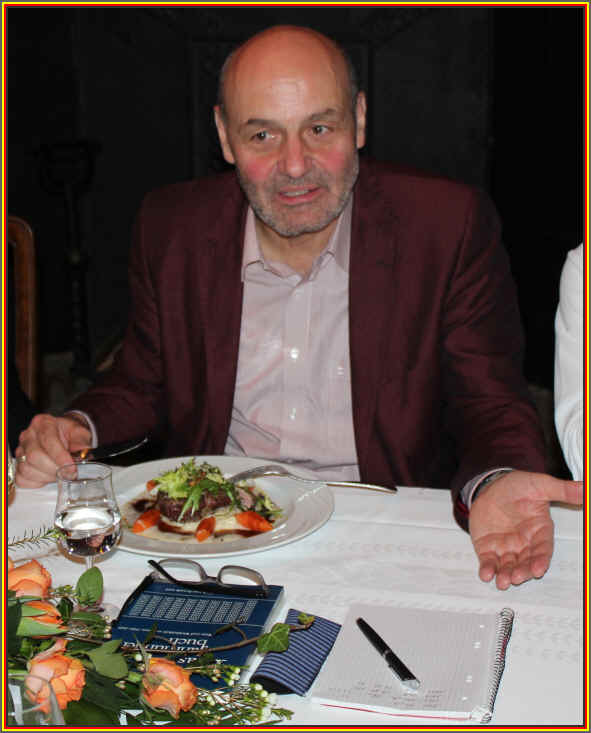 The wines tend to be rather austere, much like Herr Becker himself. 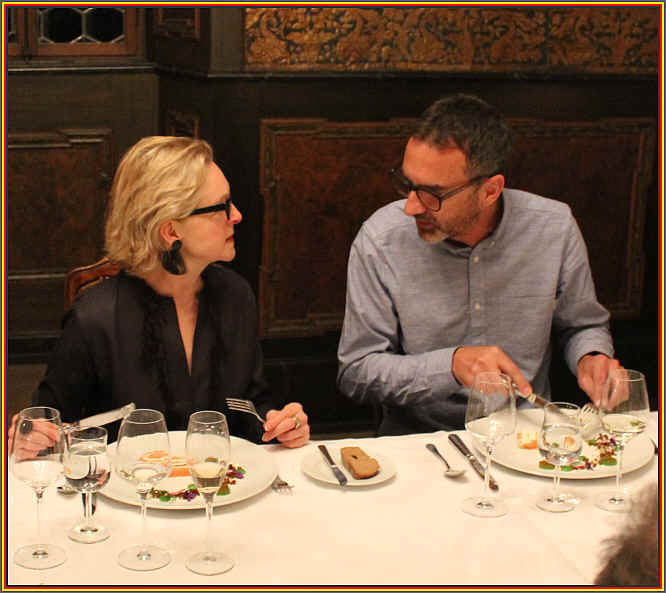 Rowald said Becker's wines typically need ten years in the bottle before they begin to tell their story. So this was a "Sp�tlese Cabinet" wine. 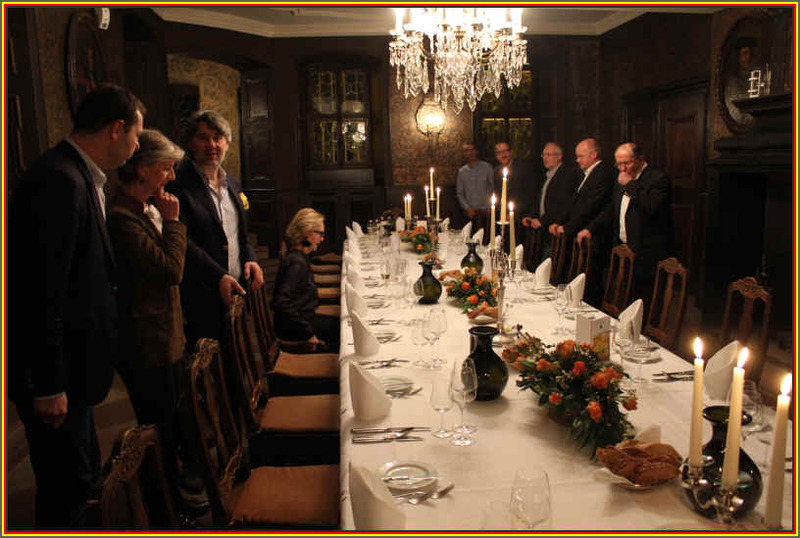 Earlier in the evening there was a discussion about the term "Cabinet" or "Kabinett." 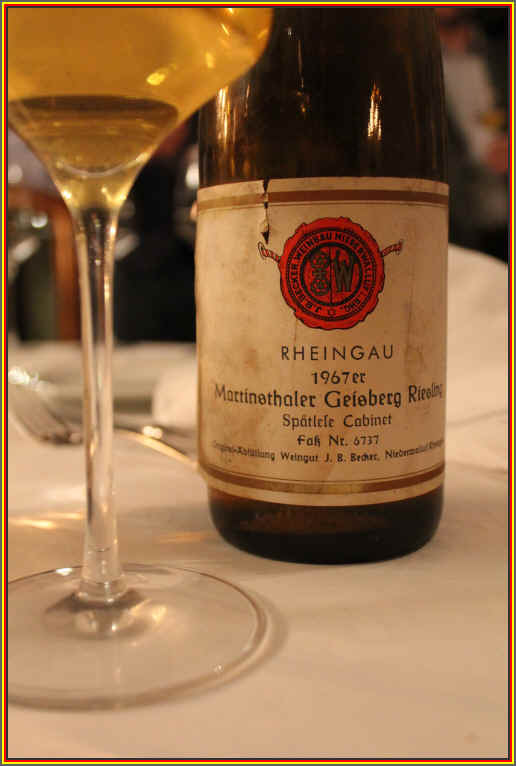 While today we know the terms Kabinett and Sp�tlese as having a particular meaning, it wasn't until 1971 that those designations came about to signify wines of quality. 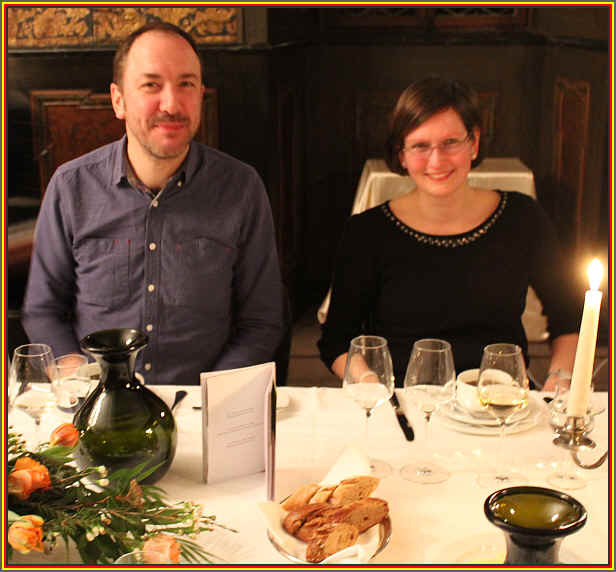 Kabinett is the entry level wine, made without the benefit of adding sugar to the unfermented grape juice. 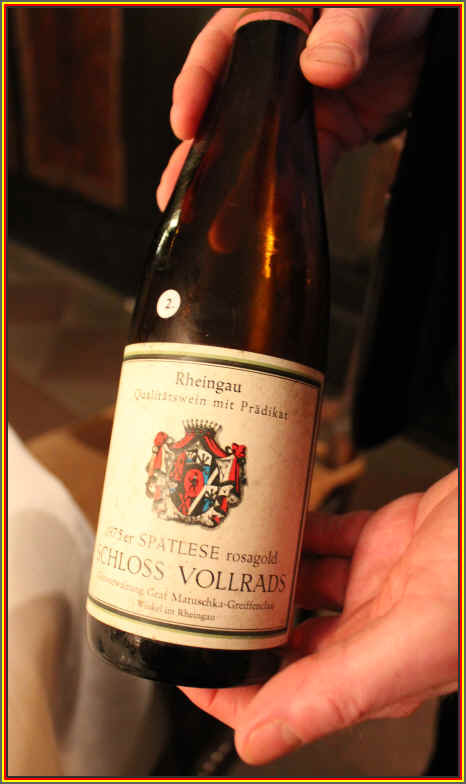 Sp�tlese means "late harvest," but this is only "late" in comparison to the juice used for the Kabinett wines today. 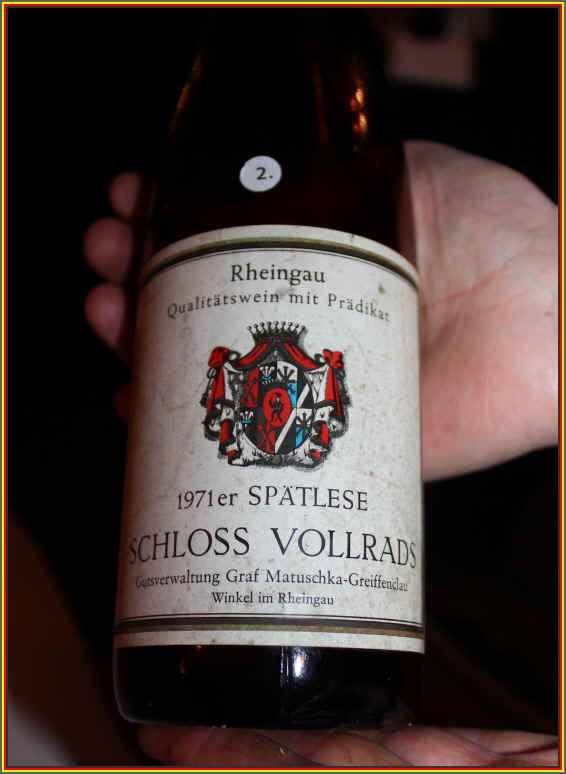 But in 1967 a Sp�tlese was a late-picked wine and the Cabinet designation is a term indicating it was thought to be a sort of "reserve" wine. And then it was off for a good snooze! 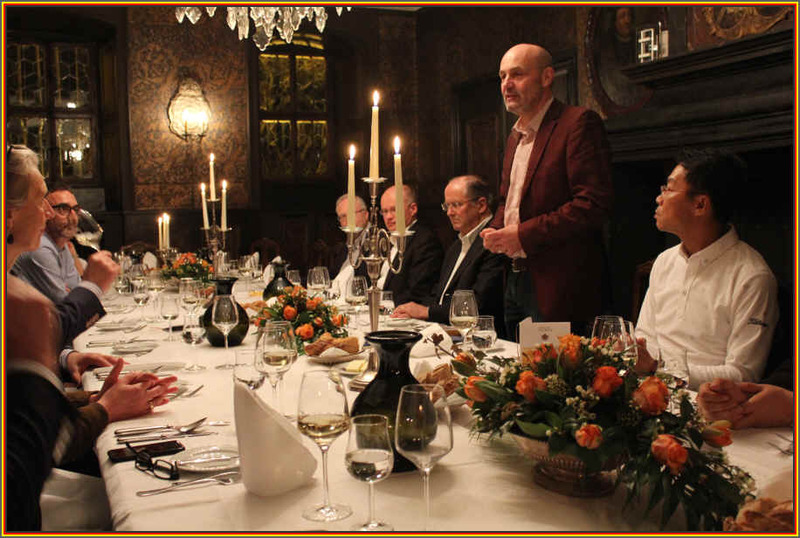 Many thanks to Rowald Hepp for the invitation and to Nedjelko Mrcela for providing the wines.